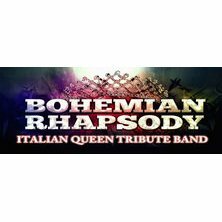 Their passion for the Queen sound and for Freddie Mercury’s voice allows them to work in most city of the sicily and now they have more projects for the future. When the band was born their objective was sing for arrive at the heart of more people and mostly arrive to peaple who can't know what the biggest voice of Freddie Mercury mean for many Queen fans. The original desire wind up their works, infact now they are in the studios for studing the arrangements of others Queen songs. I hope that their passion can bring them so far away, because the passions needed the wings, and the wings are in each of us.